AGE HAS NOT STOPPED MARTIAL RAYSEE. and more that I have learned….his oeuvre has changed frequently. Oh how I love and respect creativity that keeps being more creative and not confined. Would you just, please look at this image! 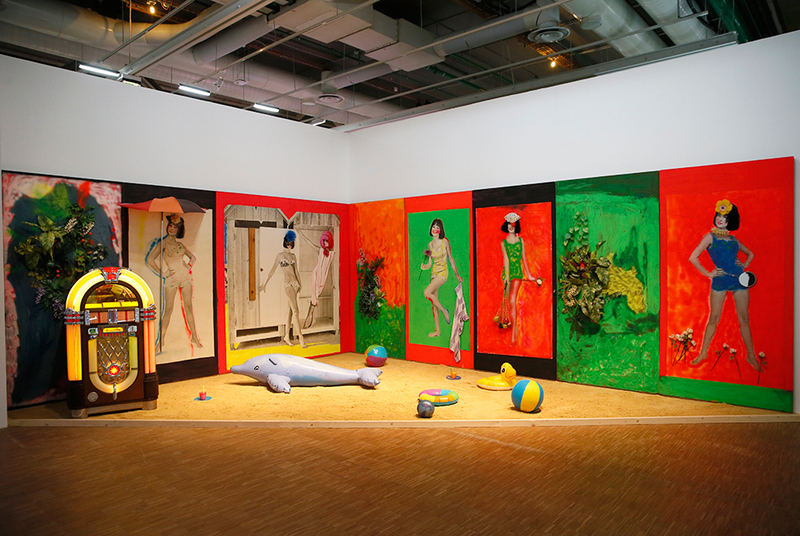 “Raysse Beach”, an artwork by French artist Martial Raysse is displayed as part of an exhibition dedicated to his work, on May 12, 2014 at the National Museum for Modern Art in the Centre Pompidou in Paris. AFP PHOTO / PATRICK KOVARIK. “Raysse Beach was created in 1962 for the Dylaby exhibition at the Stedelijk Museum in Amsterdam. Raysee’s ability to astound in multiple mediums is extrodinary.. Thought I would leave after the first few pieces, but then oooo la la, what a smorgasboard of thoughtful, inventive works.